They’re back – the Weekly Wow’s – er, Deals! 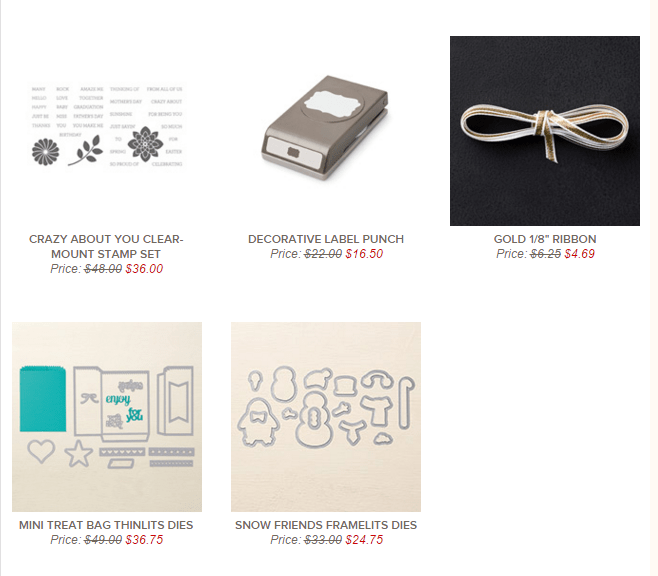 Okay – if I didn’t already have everything – yes, everything – in this week’s deals, I’d be snapping up all of them! 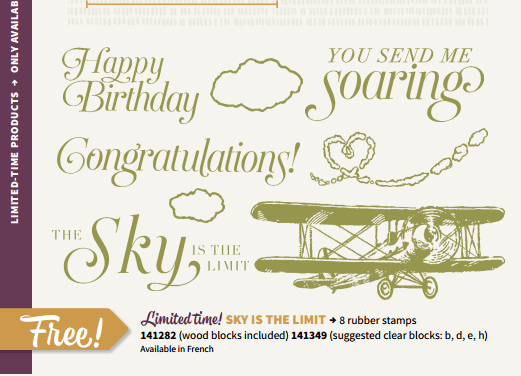 I love the Crazy About You stamp set – with so many words in this set, you can pretty much find something for every occasion. The flower stamps coordinate with 2 of our punches (Flower Medallion and 1 3/4″ Circle Punch), and if you want, you can save a bit more when you Bundle the stamp set with the Hello You Thinlits Dies – get the photopolymer bundle for only $52.50! 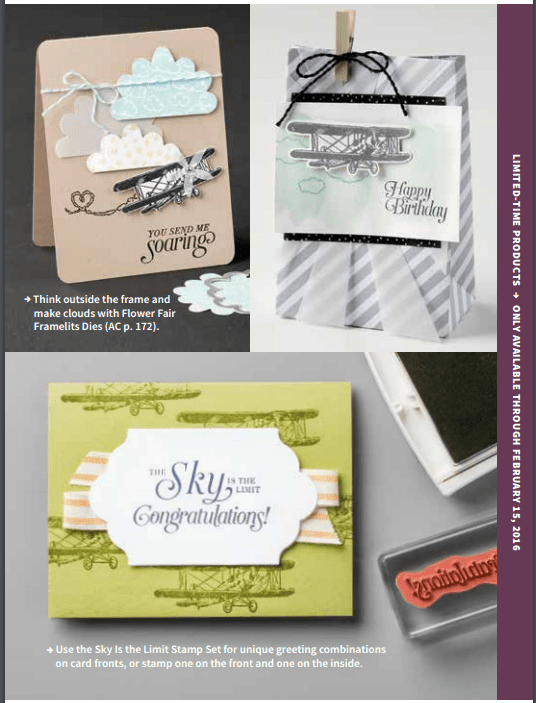 Of course the Decorative Label Punch and the Gold 1/8″ Ribbon can be used any time! I just used the punch in my project for the Paper Craft Crew challenge yesterday. The Mini Treat Bag Thinlits Dies are ‘da bomb’ – not only can you make the quick & easy gift bag (and modify it to make a larger size) but you also get 10 other dies in the set, that you can use to decorate the bag, or any other project. The Snow Friends Framelits are just too cute for words; you can use them on their own, or you can still purchase the Bundle with the Framelits and the Snow Place stamp set for only $55.25. Who says you can’t use penguins year ’round?! Would you rather have a prepared craft kit delivered to your door every month? We’ve got you covered! 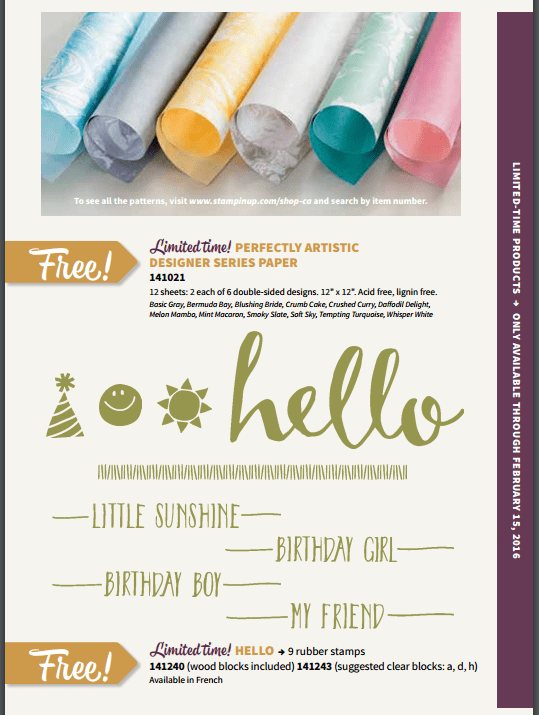 Until March 31st, you can purchase a 3 month prepaid Paper Pumpkin subscription for only $69 (regularly $74.85). And as a bonus, you get a FREE Sale-A-Bration item!! Just like that! You can add your Paper Pumpkin subscription to any order, and they add up for more Sale-A-Bration items; spend $120 and get 2 Free items! Want a whole 12 months of fun delivered to your door? You can purchase the 12 month subscription for only $275.40, saving $24, AND you get 4 Sale-A-Bration items! To take advantage of these deals, and more, CLICK HERE to go directly to my online store to order (even in your jammies! ), or give me a call or email at 604.298.0472 or debsmart@shaw.ca and I’ll be happy to take care of the ordering for you! Just a quick reminder – you only have until February 15th to get your hands on the following items from the Sale-A-Bration brochure; after that, they are being replaced! 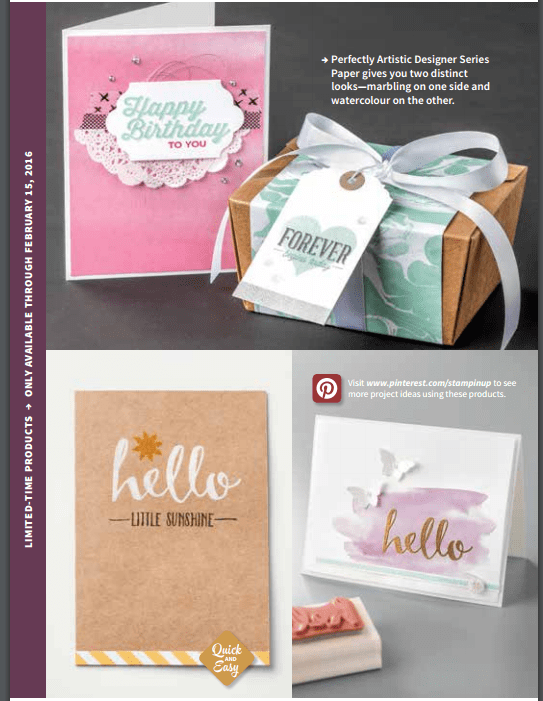 Want to know another perk of joining during Sale-A-Bration – in case getting an extra $70 in free product, free shipping and free business supplies wasn’t enough for you – you’ll also be able to pre-order before the new Annual Catalogue comes out!! *squee! * It’s like Christmas, all over again! The joy, the surprise, the spending of money – er, the joy! And you get it 1 month before the catalogue goes live 🙂 (in case you wanted to show off to your crafty friends). Lots to think about, lots of shopping to do! Just click my signature below to go directly to my online store, or CLICK HERE if you’re ready to JOIN THE FUN, and JOIN MY TEAM! Previous Previous post: Fun Paper Craft Crew Sketch Challenge!